One Third of the largest continuous areas of the HMT network along with Pocahontas and Indian Ridge trail systems and connectors. Pinnacle Creek Trail System, with direct connections to the ATV- friendly towns of Mullens and Pineville, WV, is known for its breathtaking scenic views and proximity to world- class whitewater rafting and snow skiing—both less than an hour away. This trail system has direct access to gas, food and lodging. The trail system also connects with two other Hatfield-McCoy Trail Systems—Indian Ridge and Pocahontas—to allow extended off-road trips. Wild Willy's ATV Rezort offers cabin rentals and atv/utv rentals. We are conveniently located with access to Indian Ridge, Pinnacle Creek and Pocahontas Trails. Our standard cabins accommodate four and feature bathrooms with showers, tv with cable, kitchenette with microwave, coffee maker, picnic table, firepit, charcoal grill, heat & air conditioning and more. Our Lodge accommodates up to eight with kitchen, living area, two bedrooms, tv with cable, bathroom with shower, heat and air conditioning, plus much more. Our Lodge is handicap friendly. Free WiFi and phone service available to our guests. Wild Willy's ATV Rezort is a secure facility with 24 hour camera and security system monitoring for your peace of mind. We have onsite parking, paved access to our facility and direct trail access to Indian Ridge. The Pinnacle Creek and Pocohantas Trail connectors are just a 5-10 minute ride from our facility. We have a garage onsite to assist with mechanical failures. We also offer late model, high quality atv and utv rentals for one, two or three day rental terms. We are located in McDowell, WV, 4 miles off HWY 52 at Northfork, WV and 2 miles from the Indian Ridge Trailhead at Ashland, WV. Pleave visit our website or call us for additional information. We are happy to answer any questions you may have or help you plan your atv adventure! We are glad to be part of your plans to visit Southern West Virginia. Our home is available for nightly and weekly rentals and can accommodate groups of 6-8 people or more. The house is located approximately one mile from an access point to the Hatfield~McCoy Trail System so you can ride to the trails directly from the house with no need to haul your ATV's. With access to the Pinnacle Creek, Indian Ridge and Pocahontas Trail Systems, you have over 200 miles of trails to enjoy! There is ample parking at the home for your trucks and trailers. Itmann is conveniently located between the towns of Pineville and Mullens. It is a rural residential community which is home to the now vacant, but historical "Itmann Company Store." Please contact us with any questions you may have regarding your plans to visit. We look forward to hearing from you. Set in the rugged mountains of Southern West Virginia, Twin Falls Resort State Park is the ideal site for nature seekers. Visitors to Twin Falls can enjoy overnight accommodations ranging from a 47-room lodge located on the mountain top to secluded cottages or spacious camping sites at the campground. 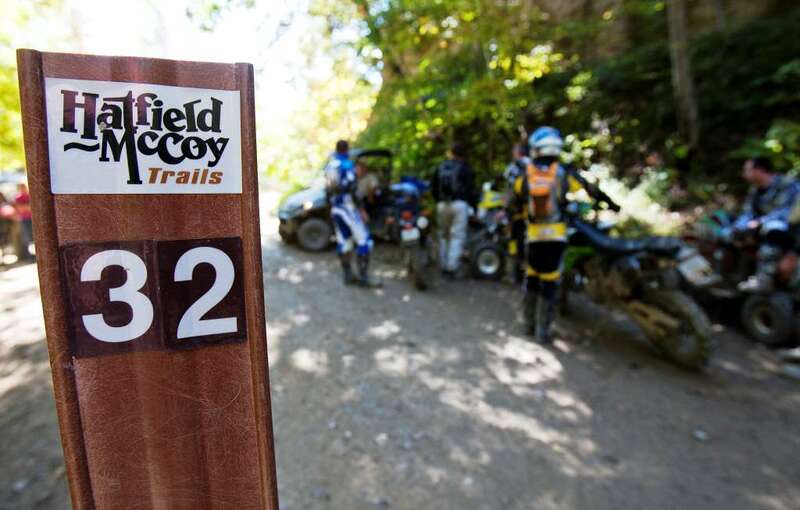 Conveniently located to the Hatfield McCoy Trails, riders are able to jump right on the trails at their leisure. Other activities at Twin Falls include 18-hole golf course, twelve scenic hiking and biking trails, picnicking, indoor swimming pool, full-service restaurant, or just relaxing with a piece of history at the Pioneer Farm. Twin Falls' down home hospitality will delight any visitor. Whether it's a family vacation, a reunion or a wedding, Twin Falls is the perfect location. Centrally located in the eastern United States, this park is easily accessible to visitors. https://us01.iqwebbook.com/TFRSPWV420/ button located on this page. Clean, Friendly, Family Environment. Kitchen with daily specials for breakfast and lunch. 50 inch TV in dining area. Store with numerous grocery items... Hatfield McCoy Permits and Merchandise... Gas and Diesel. Cold Cold Beverages. Deer Corn, Horse Feed and More. We are only 2.9 miles from the Mullens Connector...Bud E-Z Stop where service is given & hospitality is felt!!! Centrally located in Pineville, WV, Pinnacle ATV Lodging is the perfect place to rest your head while enjoying the best of wild, wonderful West Virginia. We offer clean, comfortable and convenient lodging, plenty of parking for your trailers and ATV's and convenient ATV access to the trail system without the need to trailer your ATV. Welcome to Trails Lodging, your premier lodging destination for fun and excitement in southern West Virginia. Trails Lodging is looking to continue the focus that Happy Trails Outdoor Adventures started with providing exceptional lodging services at affordable rates for adventurous guest in southern West Virginia. At Trails lodging you will find our overnight lodging and accommodations to be unsurpassed. Whether you are traveling for business or pleasure, staying one night or many, this 100% smoke-free facility of suites and cabins is sure to astound all guests with superior customer service and amenities at an affordable rate. Trails Lodging also has a trailhouse with 5 rooms, 3 baths, kitchen and living area for large groups available. Trails Lodging offers an exceptional variety of lodging variations: Single & Doubles Suites Efficiency Singles & Doubles Suites Efficiency Jacuzzi Suites Cabins Trailhouse Each guest room and cabin features cable television and wireless high-speed internet access. From a single person to a very large group, Trails Lodging is your #1 lodging destinations in southern West Virginia. Trails Lodging is looking forward to meeting all your lodging needs, whether you are looking for a suite, cabin, or house give us a call today (1-877-498-2887) and speak with one of our friendly staff members, and let us help plan your next southern West Virginia Adventure!